This is a vibrant shop offering espresso drinks and artisanal baked goods with globally popular deserts like French pastries and macaroons. The franchise mission is to share authentic international treats and sweets with exceptional coffee drinks for the American public. This is a very hot market. The Pastries are prepared frozen at franchise HQ and shipped to your location. You only need a small oven to finish the product and display for sale. You are not a pastry chef. This unique business model is a very simple and high quality. You can be an owner operator or hire a manager and be a semi-absentee owner. The Executive team, with proven experience in growing franchise systems, has focused the brand on unsurpassed quality, aesthetic appeal, variety, innovation, and simplicity. Franchise produces and procures macarons, confections, pastries, sandwiches, coffee drinks and beverages from around the world, allowing an individual to indulge for themselves and create a fantastic sharing experience. Franchisees focus on selling both at retail and using non-retail channels such as B2B, events (e.g. Weddings), and corporate gifting. Note. Serious investors only please. The business will not respond to general inquires, students or brokers. Please reply with: Your full name Home mailing address, Phone numbers and best time to contact you are required. Your information will be kept confidential and you will get quick response. Interested buyers must have a minimum net worth of at least $300,000 with at least $50K in working capital. The information contained in this ad does not constitute an offer to sell or award a franchise. Such an offer can only be made in compliance with applicable disclosure laws and a Franchise Disclosure Document. Check for current pricing and availability. Affordable Business Concepts, LLC does not make any guarantees or declarations regarding earnings. Buyer must be a US Citizen. It is easy to find great real estate in places where the franchise will really take off. 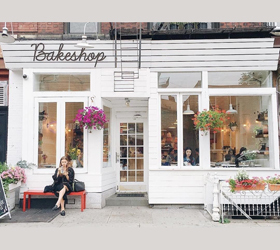 Having a small footprint also means the stores are easy to get up and running and have lower construction costs.The Bakeshop is designed to occupy a very small footprint, like 400 square feet to a maximum of 1000 square feet. This makes the business economical in markets with expensive real estate. This unique franchise is the best of all options. Coffee shops usually offer a poor selection of pastries. Pastry shops usually don't offer or understand quality espresso drinks. This franchise offers quality expresso drinks and exceptional quality pastries. They also have multiple revenue streams from B2C and B2B. They supply Weddings, special events, corporate catering as well as walk in customers. This is a trendy fast growth market. Stores like Whole Foods have recently seen a 40% increase in sales of these products. The franchise has locations rapidly expanding across the country and is uniquely poised to capture an outsized share of the booming $310 billion American baking industry. Multiple units are available for several different business models including kiosks you can add for $63K each. We can help you obtain SBA pre-qualification in about 24 hours after application. We can also help you unlock your 401K without penalties or refer you to franchise friendly lenders. Extensive training is provided by the franchise. They offer pretraining, HQ training and training in your store. Superior support is also provided with weekly calls and much more. This is a franchise looking for a quality franchisee to service this exclusive territory. This is not an Existing Franchise for resale by the Franchisee. Contact ABC to check for current pricing and availability. Affordable Business Concepts, LLC does not make any guarantees or declarations regarding earnings. The information contained in this ad does not constitute an offer to sell or award a franchise and may not reflect the most current facts. Such an offer can only be made in compliance with applicable disclosure laws. Offerings are made by Franchise Disclosure Document only.